You can listen to Boss Radio anywhere! Boss Radio is free on any iOS or Android device! 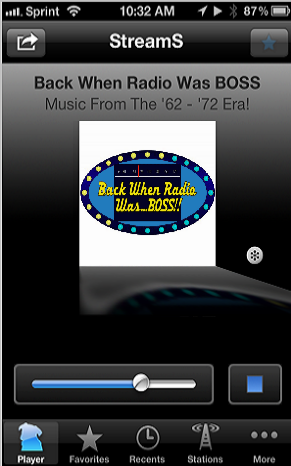 BACK WHEN RADIO WAS BOSS is a music program based around the songs of the 1962 through 1973 period of top 40 radio. We use "Jingle Imaging" to create a mood and memory of this music as it was first presented. All of the music, segues, and sweeps are researched. If you listen closely, the songs have a true relationship to each other. We worked closely with Johnny Mann, the original talent behind the "Boss Jingles" of the 1960's, and re-created over 100 custom jingles for this program. Like the originals, the jingles are forward-imaging. Our music library is based around over 1500 songs. We searched out every original stereo version. Many of your favorite songs - in stereo - will only be heard on Boss Radio! ALL SONGS ARE THE ORIGINAL RECORDINGS. Artist, Music, and jingle association are the keys to this programming concept. The new BOSS RADIO will have a few extra features like the occasional ACTUALITY heard ahead of certain songs. Our actualities are drawn from a huge bank that was used in the "History of Rock And Roll" production of the 70's. Five years in development has created a fast paced music program, that sounds great today - you might say IT SOUNDS BOSS! BOSS RADIO changed the way that music was played and listened to on the radio between the years 1965-72. CKLW KHJ KING KYNO KFRC KGB KAKC WHBQ WRKO CHUM WOR-FM. Over 80 million baby boomers first heard their favorite songs on a Drake formatted "BOSS RADIO" Station. We are happy to present this format... once again. BOSS RADIO now has it's own FREE app available on iTunes and Google Play check it out!